Anthony E. Munroe talks about his work with the fervor of an artist or activist. "It is my ministry," says Munroe, a 2001 graduate of the Executive Master's Program and president and CEO of one of the nation's largest community health-care centers. "It's not a 9-to-5 job for me. It is part of who and what I am." That is because Munroe, who once thought he'd become a doctor, constantly reminds himself and his colleagues about the true nature of their work. Even though the Miami-based Economic Opportunity Family Health Center handles more than 130,000 patient visits each year, Munroe has not forgotten that each of those visits involves a person in need. "In health care, all the statistics represent people," says the 38-year-old executive. "I emphasize to my staff that they can't just look at the numbers. These are lives — people, children, unborn children. To realize that we're doing something to help these human lives is an awesome feeling." The lives on Munroe's patient list include many who might otherwise fall through the social safety net, including illegal immigrants, the homeless and the uninsured. The organization provides medical, dental, mental, substance abuse and social services to about 30,000 Miami-Dade residents each year, regardless of their ability to pay. Since assuming the reins of EOFHC five years ago, Munroe has expanded the number of EOFHC permanent health-care sites from 13 to 17, opening newer facilities in underserved areas. He has also placed nurses and other health services within Miami public schools, and he has forged partnerships between local colleges to train more nurses for the minority community. His most wide-ranging innovation, however, has been the creation of teams of mobile health-care units to seek out the Miami residents least likely to get themselves to a doctor. "We found one man who had had surgery years ago, and he had an item left inside him," Munroe recalls. "He was unemployed and homeless, and he'd never been back to the doctor. He had an infection and was in terrible pain. We referred him to one of our medical facilities, and he got the item removed. He's doing fine now, but thank goodness he found us." Munroe is no stranger to the front lines of public health. As a teenager he worked as an emergency-room volunteer at a local hospital. His mother, a nurse, and other family members who worked in health care encouraged his interest in the field. "I always knew I wanted to help people in whatever way I could," he says. "I toyed with the idea of becoming a physician, but then I realized that I really enjoyed the financial side of health care — the numbers, the strategy, the planning." Since then, Munroe has held executive-level positions in some of the nation's most prestigious academic centers. 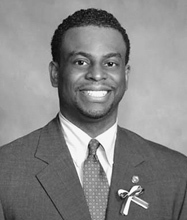 He has worked as director of community health promotion for the DeKalb County Board of Health in suburban Atlanta, and as executive director of family health services for the New York City Department of Health. He holds a master's degree in public health from Columbia University and is pursuing a doctorate of science from the Tulane University School of Public Health and Tropical Medicine. Munroe's achievements were recognized earlier this year by the American College for Healthcare Executives, which named him the 2003 winner of its Robert S. Hudgens Memorial Award. The prestigious national award recognizes an under-40 health-care executive for demonstrated leadership, motivation, innovation and creativity. Munroe points to Kellogg for giving him the tools to tackle the most pressing issues in his field. "Some of our challenges are very, very daunting, and many of my Kellogg classes remain particularly timely and relevant," Munroe says. "It's certainly not all theory to me."